Zaldiar prescriptions are currently not available via our online consultation service. You can, however, request an online consultation for nerve pain. Tramacet 325 mg /37.5mg 60 Tabl. Does Zaldiar have any side effects? Tramacet is unavailable. Please follow this link to find other medicines to treat "Migraine". This product is no longer available for UK residents, please choose another pain relief treatment. Tramadol containing products are available for non UK residents only. Please also note that this product has a delivery time up to 4 business days after receipt of payment and approval of the doctor (issuing prescription). If you pay by credit card your payment will be processed the same day. Tramacet, or Zaldiar, contains both paracetamol and tramadol. These two substances combined make it an effective prescription painkiller for treating moderate to severe pain. See here for more information and to order Zaldiar with an online consultation via Dokteronline.com. Pain is a signal that tells you that there is damage to a particular area in your body. The first step in pain control is treatment with paracetamol. If this does not have the desired effect, tramadol or a combination of paracetamol and tramadol is step two. Tramacet (Zaldiar) tablets contain 325 mg paracetamol and 37.5 mg tramadol. These two substances work together to alleviate the pain. Zaldiar can help with local pain as well as general pain. Always follow the instructions of your doctor or pharmacist. The usual starting dose is two tablets daily. Do not take more than eight tablets a day. Swallow the tablets whole with some water. If you have forgotten to take your dose of Zaldiar, do not take the missed dose. Never take a double dose to catch up. Consult your doctor if you feel Zaldiar is too strong for you. 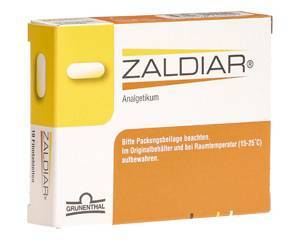 Do not take Zaldiar in combination with alcohol, soporifics or other pain medication. Zaldiar is not safe to use during pregnancy or while breastfeeding. Be sure to read the package leaflet before you start using the medicine. Just like any other medicine, Zaldiar may cause side effects. The most common side effects are nausea and drowsiness. For a full list of possible side effects, see the leaflet that comes in the packet with your medicine. If you experience side effects that are not listed on the leaflet, consult your doctor. With an online consultation from Dokteronline.com, you can safely order genuine Tramacet/Zaldiar.